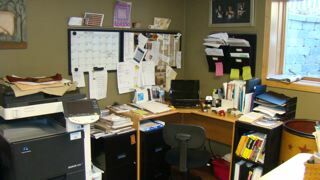 Well my desk area is all back together and is messy as usual. 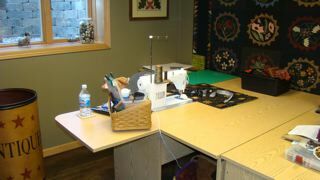 My sewing space in in the shape of an “L”. In the short side of the “L” is this space where there is a 3×6 window and then my sewing machine is to the right of here. I will show the long part of the “L” another day. I am working on a Lori Smith Fit to Frame. I finished the top at the retreat this last weekend now I am quilting it. 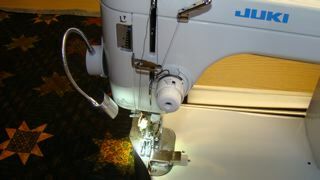 I got a new light on my machine…it is the best! It adheres to the side and has little clips to hold the cord to the back of your machine. I am putting on a singlefold binding, because of this quilt is only 18×24. But this light makes it alot easier to see everything. I quilted crosshatching 1″ apart both ways…Mark your quilts with a hera marker it is fast and easy. I’m thinkin’ I need one of those lights!!!! Looks like it gets the light where you need it!!! I also have that nifty little light and don’t know how I ever survived without it.